Welcome to this first ever Christmas and New Year TLFG special. After deliberating over which fixtures to put in I decided to go the whole hog and give you all the info you need for the next three weeks. The period in question includes a jam-packed programme of over 180 games including heavyweight Premier League contests, the FA Cup third round and more local derbies than you can shake a stick at. I've created four match maps to make it easier for you to find a fixture but more on that later. My football travels this week took me back to London's East End to watch London APSA play landlords Clapton in the Essex Senior League. The fantastically named Old Spotted Dog Ground, home to Clapton since 1888, has definitely seen better days but embodies what non-league football is all about and all groundhoppers must visit it if they haven't done so already. APSA, formed in 1993, are one of the youngest senior clubs in London while the Tons are one of the oldest having started out in 1878. Both, however, are very evenly matched and have spent the season towards the wrong end of the table. Although this was a derby, the attendance wasn't great and was never going to be given that West Ham were playing Barnsley a mile away and were charging only £15 to get in. 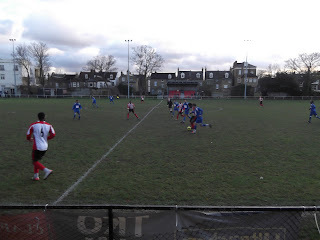 The match was full of endeavour but the heavy pitch meant any chance of good football was almost impossible. It looked destined to be a 0-0 draw until a the Tons took an 84th-minute lead after APSA's keeper could only parry a low shot back into the danger area. Somehow the 'hosts' managed to conjure up an equaliser soon after before both sides went close to winning it in injury time. A 1-1 draw was definitely fair. If you've got some free time over the next few weeks, there are ample opportunities to see a game at the 'Dog' so get yourself down there. As always please share you stories and experiences of football in London either in the comments section below or on our Facebook page. Also, feel free to add your photos to our Flickr group. Other tickets will go on sale before I next write so check the clubs' websites for more information to make sure you don't miss out. This would normally be the point where I would lead into my recommendations for the week ahead but given almost every game is notable for being either a derby or a cracking cup tie then I'm not even going to try. I'll leave it up to you to search through the maps to pick the best ones that are most convenient for you. Please also make sure you check with clubs that fixtures are going ahead - apart from the weather, several teams also stand to be affected if Croydon Athletic do sadly fold. Although I won't be blogging for a while, I will still try and keep the Twitter account up to date and will answer emails when I can. So that's it from me for 2011, have a great festive one and hope to have you all on board when I get TLFG back up and running in the New Year. Hello, firstly congratulations for this great blog. I have a question: I need a game on 6th and 9th january: Wycombe-Huddersfield and Aveley-Carshalton are the only options? Thanks. If you need any more information or advice, let me know. These maps work great on my phone, and help so much with planning. Thanks so much! Any chance you could expand to, say, 30 miles outside of the M25?! I'm looking for a non-league game for Tuesday or Wednesday. I have found Crawley Downs, Horsham YMCA, South Park and Met Police. Are you aware of anymore within hitting distance from London? pompeydunc - glad to be of help. Apart from the games you've listed, you could try Wessex League club Fleet Spurs on the 3 Jan, they play in Farnborough. If you decide to go to Met Police, I think it's a veterans' game so don't go expecting a big Ryman League clash. My brother uses professional college essay help cause he spends all his time on football and everyone is mad at him that he misses the classes.